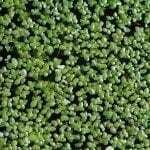 What are hydrophytes? In general terms, hydrophytes (hydrophytic plants) are plants that are adapted to survive in oxygen-challenged aquatic environments. Hydrophytic plants have several adaptations that allow them to survive in water. For example, water lilies and lotus are anchored in the soil by shallow roots. The plants are equipped with long, hollow stems that reach the surface of the water, and large, flat, waxy leaves that allow the top of the plant to float. The plants grow in water as deep as 6 feet. Other types of hydrophytic plants, such as duckweed or coontail, are not rooted in the soil; they float freely on the surface of the water. The plants have air sacs or large spaces between the cells, which provide buoyancy that allows the plant to float on top of the water. Some types, including eelgrass or hydrilla, are completely submerged in water. These plants are rooted in the mud. Hydrophytic plants grow in water or in soil that is consistently wet. Examples of hydrophyte habitats include fresh or salt water marshes, savannahs, bays, swamps, ponds, lakes, bogs, fens, quiet streams, tidal flats and estuaries. Hydrophytic plant growth and location depends on a number of factors, including climate, water depth, salt content, and soil chemistry. Several interesting carnivorous plants are hydrophytic, including sundew and northern pitcher plant. Orchids that grow in hydrophytic environments include white-fringed orchid, purple-fringed orchid, green wood orchid and rose pogonia.